Nothing beats a sporty life filled with adventure. Wrong. Nothing beats a sporty life filled with adventure with a GoPro. It’s the easiest most advanced way to capture, edit, flaunt, share and relive your latest and greatest adventures. For those of us who shy away from advanced technology, GoPro is simple to use, versatile and fun. Once you’ve made the decision to make a small investment in the hottest specialty camera on the market, the next step is to decide which edition to purchase. Consider how you will use the camera, how much you want to spend and in what elements to plan to shoot. 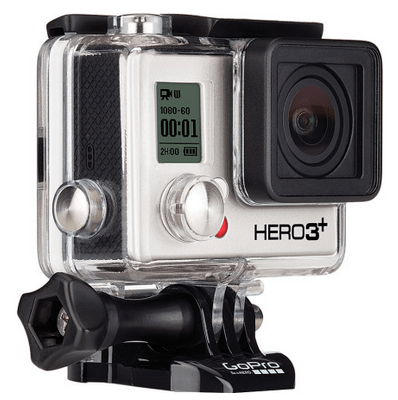 The Hero3 comes in three editions: White, Silver and Black. White is the most basic and inexpensive while Black offers the most professional quality and extensive options for extreme sports shooting. 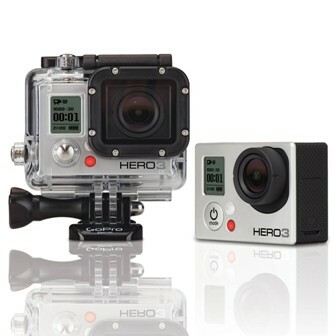 Let’s zoom in on the GoPro HERO 3 Silver Edition which retails for approximately $299. The Silver Edition comes complete with waterproof housing, rechargeable Li-ion battery, QR buckle, J-Hook buckle, 3-way pivot, one curved and one flat adhesive mount and a USB Charging cable. Since the GoPro takes a smaller version of the SD card called a micro SD, I suggest having more than one card on hand. There is nothing worse than running out of space on an SD card just when you need it. A spur of the moment adventure is great, as long as you’ve downloaded and updated your memory card to allow for added storage space ahead of time. Your best option is a minimum 32GB/16GB Micro SD card. Since snowshoeing is not as fast-moving as other sports, recording treks on longer trails will take more memory than other activities. Transferring files to the computer is easy with the USB cable, or you can transfer to a TV with the HDMI cable. If you are like me and tend to do a little of everything, deciding on only one sport specific mount can be painful. I recommend the chest mount for snowshoeing. It straps across the front of your chest, allows for comfort, stretch and maneuverability while at the same time capturing great footage from chest level. (insert chest mount photo). Other mount options available for purchase fit surfboards, helmets, handlebars, your head, vehicles, gear and more. The GoPro has become iconic in the sports world because of the camera’s ability to mount to just about every piece of equipment or gear out there. The downside is that you’ll want them all! As they are sold separately, this can be costly. Default settings for the Hero3 Silver Edition are video resolution 1080p 30fps, photo resolution 11MP, photoburst 10 photos per second and time lapse .5 seconds. In non-techy lingo that means the default settings are perfect just the way they are unless you require professional quality images and video. If that is the case, the GoPro Hero3 Silver Edition will allow for advanced shooting options and settings like Protune, all at the touch of the settings button. Simple. The housing that encases the camera for protection from the elements is waterproof to 197’/60m and made of polycarbonate and stainless steel. There are two backdoor options. The skeleton backdoor is best used when sound quality is a priority and the standard is best used when waterproofing is essential. Both options come with the purchase of the camera. The new updated latch system on the Hero3 allows for one-handed open and close functionality perfect when you need to remove the camera from the housing case for data transfer, to charge the battery or SD card, to de-fog or simply to double to your check settings. Attaching the camera to a mount is super easy with the attachment buckle which links into the camera case with a large screw that is universal for all mounts. Camera functions for the average user are straight forward. When you get into the advanced settings, you need to study the manual and master the options. On the front of the camera is the main mode and power button. Pushing this allows you to switch the camera mode to video, photo, photo burst, time lapse or playback. On the top of the camera is the settings button. This allows the user to adjust resolution, FPS and view angle within each camera mode setting. For a full breakdown of best use settings refer to the detailed online manual which has reference charts depending on your personal needs. The White and Silver Editions do not have built-in Wi-Fi but are Wi-Fi remote compatible. Overall the camera is a gem. I love strapping on my Hero3 Silver Edition with a chesty mount and shooting activities not typically mainstream like yoga, adventure racing and snowshoeing. Another great part of joining the GoPro movement is the online community. Between the app and the Facebook page you can share your best vids with other adventurous souls around the globe. Check out my solo mission up the Snowshoe Grind at Grouse Mountain. Great quality and picture sharpness. With Christmas coming and the new Hero3+ on the market, life with your GoPro is just going to keep getting better and more advanced. Be sure to enter to the ‘How Will You GoPro’ contest before December 4th and give the gift of gear this Christmas. You’ll be the Hero! Click HERE for details. For the full online Hero3 Silver Edition manual click HERE. To purchase a GoPro Hero3, click HERE. Snowshoeing Education 305: Are Two Poles Better than One? Snowshoeing Education 301: Up for the Season? This entry was posted in Features, Gear, Homepage Featured and tagged Adventure camera, BC, camera, GoPro, GoPro Hero3 Silver Edition, Grouse Mountain, Hero3+, mounts, outdoors, Snowshoe Grind, Snowshoeing by Steph Florian. Bookmark the permalink.